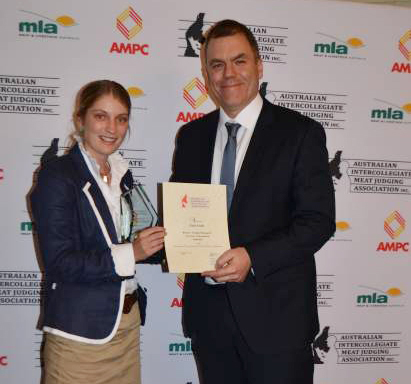 Angus Australia Youth Member, Chloe Gould from Gympie, QLD has taken out the individual champion award, the AMPC Founders Buckle at this years Australian Intercollegiate Meat Judging (ICMJ) competition, hosted by Charles Sturt University (CSU) in Wagga Wagga. Over 130 students from 10 Australian and 4 international universities from the United States, Japan, South Korea and Indonesia competed for the Roy McDonald team Shield, sponsored by Meat and Livestock Australia, with the University of Queensland team taking top honours. Chloe, who was also a member of the winning University of Queensland team, can be seen here being presented with her award by Tom Maguire, GM of Corporate Affairs at Teys Australia and Director of AMPC. The competition this year was very close with only four points separating first and fifth places. Mr Maguire praised the Australian ICMJ competition for securing future talent in the Australian red meat industry. Students are required to judge beef, lamb and pork carcasses, focusing on yield, muscling and quality to evaluate their retail value along with identifying a range of beef primal cuts and beef, lamb and pork retail cuts. Chloe has been selected for the Industry Training week in Brisbane where 5 students will be selected to be part of the Australian National ICMJ team to compete in the US ICMJ competition held in January 2017. Angus Australia would like to congratulate Chloe on her success and wish her all the best in her upcoming week in Brisbane.